The cloud reportedly disappeared after five minutes or so. A clip of a strange cloud formation in Brazil has left both locals and the Internet baffled. 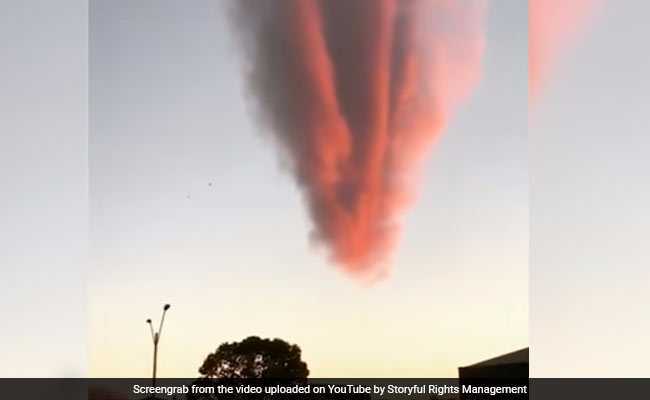 The video recorded by Joao Paulo Magalhaes in Teixeira de Freitas, Brazil, shows a huge orange cloud resembling the shape of an arrow in an otherwise clear sky. Soon, several other pictures of the cloud popped up on Instagram, with many wondering what the sight actually was. "Is it the formation of a tornado or the entrance of a meteorite?" Mr Magalhaes wrote on Instagram. The phenomenon was recorded on Thursday afternoon. He mentions in the comments section of his Instagram post that when he initially saw the cloud, he was afraid it was going to turn into a tornado. However, the cloud reportedly disappeared after five minutes or so. According to local meteorologists, the formation was actually a dust cloud, reports DailyMail.